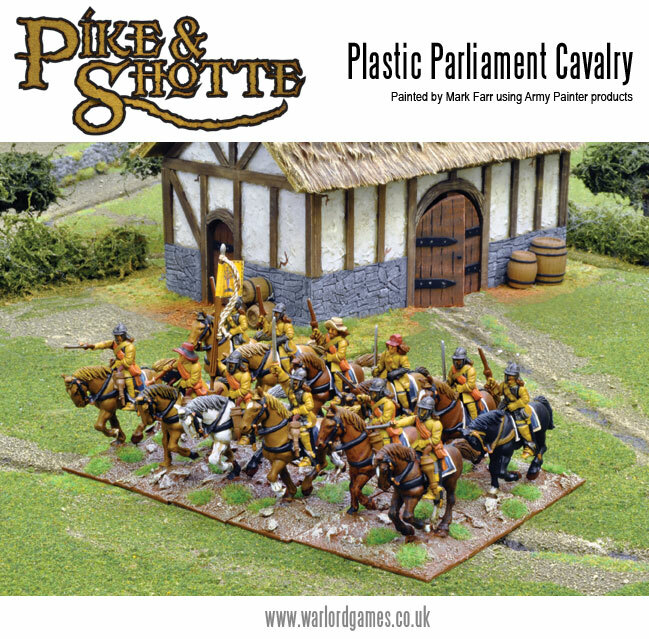 Pike & Shotte are a set of rules from Warlord Games looking at combat in the 16th & 17th Century. The original intention was for them to be a supplement for Black Powder, much in the same was as The Last Argument of Kings, but they grew too large to be a simple supplement and so became as set of rules in their own right. Bearing this in mind, anyone who is familiar with Black Powder, or even with Hail Caesar, will find much in this book, at least in the basic mechanics of the game, which are very similar. However, if you haven’t seen these previous rules, let me offer up a brief explanation. Pike & Shotte is a big battle game, where troops are deployed as elements, rather than individuals. 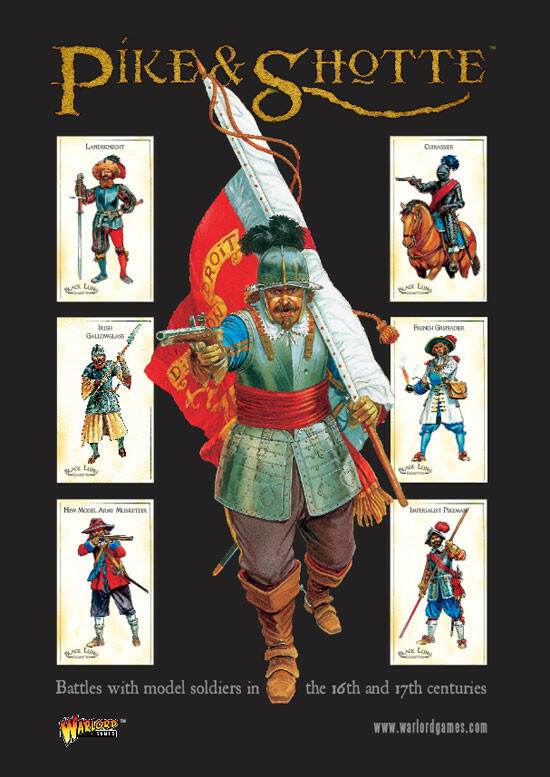 An army is made up of a number of Battlia, with each Battalia compromising a number of units (usually between three and twelve) with a commander. One of the Battalia Commanders is designated the army General. All Troops are defined as a unit, and are split into Foot, (which is further subdivided in Block, Battle Line, Warband & Skirmishers) Horse (Subdivided into Lancers, Cuirassiers, Harquebusiers & Dragoons, and by type – Heavy, Medium or Light), Ordnance and Baggage. Each unit is further defined by a set of characteristics, giving its Type, Armament, Hand-to-hand value, Shooting value, Morale, Stamina and Special Rules. These characteristics control exactly how each unit moves and fights on the battlefield. 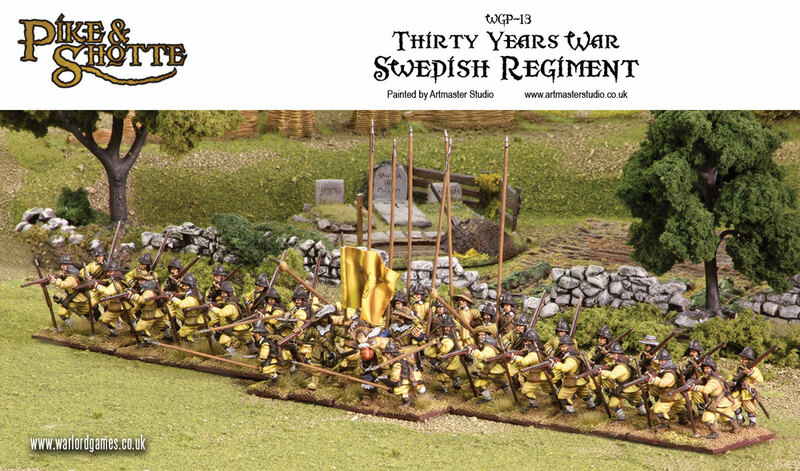 Units can be defined as Standard, Large or Small, and the average number of models and unit frontages are presented, although it has to be noted that these are generally given for 28mm models, and if you are playing with larger or smaller scales, then some ‘massaging’ of units sizes, as well as ground scale, may be in order. The game turn sequence is I-Go-U-Go, with each player performing three phases – Command, Ranged Attacks and Hand-to-hand combat. In the Command phase, each Battalia commander may issue orders to units under his command, one at a time. Once the order has been issued, the player rolls 2D6 and compares the result to the commanders Command Value. If the roll is over the Command Value, the order fails and the commander may issue no further orders to any units under his command. If the roll is equal or less that his Command Value, then the unit may make one, two or three moves to fulfil the order, dependent upon the dice roll. Typically, Infantry move 6”, Cavalry and Dragoons 9”, so if you are not careful when issuing orders, and comment of “unit will advance towards the enemy” could result in your Cavalry disappearing 27” off into the distance! Once movement is complete, units within range may engage in Ranged combat. Maximum range for muskets is 18”. Once all Ranged combat is complete, and units that charged the enemy, or were previously engaged in hand-to-hand combat, now fight. Combat works in a very similar way, whether it be Ranged or Hand-to-hand, the only difference being that in hand-to-hand combat, both attacker and defender roll dice (although combat is classed as simultaneous) The attacking unit rolls the number of D6 equal to it’s Hand-to-hand or Shooting value. Although modifiers can be applied, usually a roll of 4+ will cause a hit. The defending unit then rolls a number of dice equal to the number of hits inflicted, looking to roll equal or above their morale value. Any hits not saved in this way cause casualties, and once a unit has suffered the number of casualties equal or greater than it’s stamina, it’s subject to morale rolls – should it fail, it will either retreat or rout from the battlefield entirely. A battalia becomes ‘broken’ once half its units are lost. If half of an armies battalia become ‘broken’, then the entire army is deemed to be ‘broken’ and usually this denotes the end of the game. Obviously this is a very brief overview of how the mechanics work, and the explanations of how movement and combat work are very detailed and well illustrated. 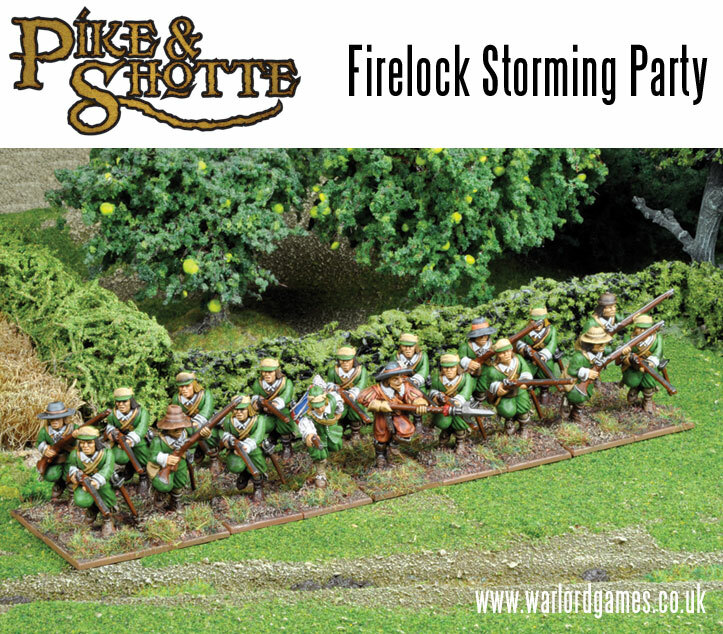 The first 90 pages of the rulebook deal with an explanation of Pike & Shotte warfare, what formations troops used and in-depth explanations of all the game rules. Particular attention is paid to where Pike & Shotte warfare differs from other periods, such as the use of Dragoons and the key Hedgehog formation. The second half of the book consists of an explanation of a number of wars during the 16th & 17th Century. Each war is given a basic introduction, some sample armies and then a battle report. Wars include The Italian Wars (Battle of Pavia), Tudor Warfare (An engagement between English & Irish), The Thirty Years War (Battle between Imperial Catholic League & Swedish armies) and the Wars of the Sun King (Battle of Walcourt). Particular attention is paid to the English Civil War and army lists for all the main protagonists are given, along with further details including many flags and regiment colour schemes. 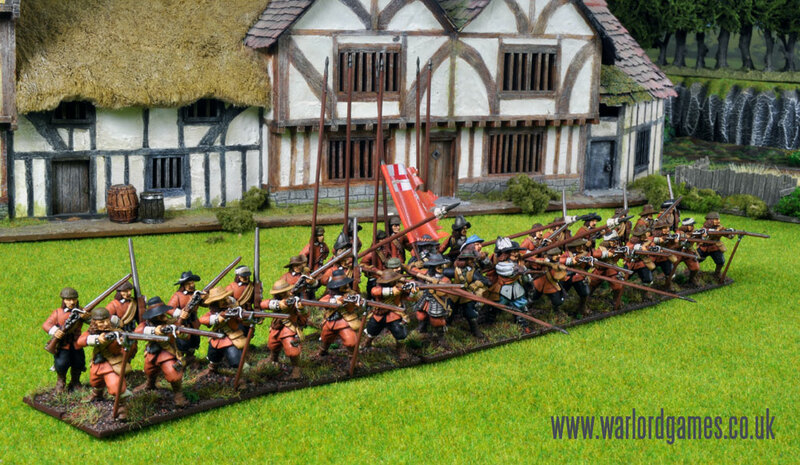 Two battle reports are presented – the Siege of Worcester and the Battle of Cropredy Bridge. The book concludes with some notes on the use of army lists and points values, suggestions of how different scale models are used and a Quick Reference Sheet. If you have read either Black Powder or Hail Caesar, then as I previously suggested, there is much in this book you will find familiar. The basic mechanics have not changed, although there may be variations in the use of certain special rules and the introduction of new formations – especially the Hedgehog. As with the previous publications, the rules are present in such a way as to be a number of ‘suggestions’ with carte blanche being given to the reader to change anything where their opinion of how certain formations or troops should work differs from that of the author – so still a set of rules more suited to ‘friendly’ games rather than the tournament scene. The book itself is stunning to look at. Artwork and pictures of beautifully painted miniatures adorn virtually every page. Whilst much of the artwork will be familiar to anyone who has seen the cover art of Warlords various Pike & Shotte miniature box sets, the model photography is superb, and is surely enough to inspire and enthuse the most reticent of gamers. What I found particularly striking was that so many of the photos were taken from a “model’s eye view”, which gave them a life of their own. So, a book which is a worthy addition to any gamer’s coffee table. Whilst the quality of this publication is not in doubt, I suspect whether you will like or play these rules will be very much dependent upon how much you like the command system that they shares with Black Powder, Hail Caesar, and indeed the ‘Warmaster’ series of rules where these rules have their roots. However if you, like me, simply love to read beautiful rulebooks, these really are a ‘must buy’. Thanks for this review. It’s been on my list for ages, as my 25mm italian wars armies are slowly painted. (What? It’s only been, err, 14 years since I bought them. Landsknechts are HARD.). I do have a New Model Army painted and ready to go. Interesting and timely review. We have a game planned (hopefully with the author present as well) that we’re going to record and release on YouTube in the near’ish future. Thanks for the review, Neil. This was the first rules set I picked up when I got into historical wargaming a bit over two years ago (only a few months after discovering the M&M podcast) due to my years long curiosity about the Thirty Years War. I play P&S with 10mm figures with ranges changed from inches to cm. I believe that not only P&S but Black Powder and Hail Caesar work better at smaller scales than 28mm. 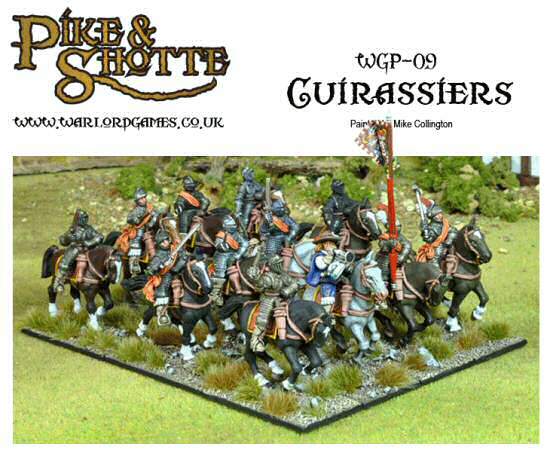 For larger club games it’s great with 28mm minis I’m sure but if you are using a more regular sized table, considering the size of units when using 28mm figures, the fact that this is a set of rules meant to play battles and considering the possible speed of units (potentially 36″ for light cavalry and up to 18″ for foot infantry) a 6′ by 4′ table is VERY small. Especially if you want units which look decent enough as a formation rather than just a few guys and a flag. You pointed this possible problem of scale out in your Black Powder review on the podcast back then and it is true. 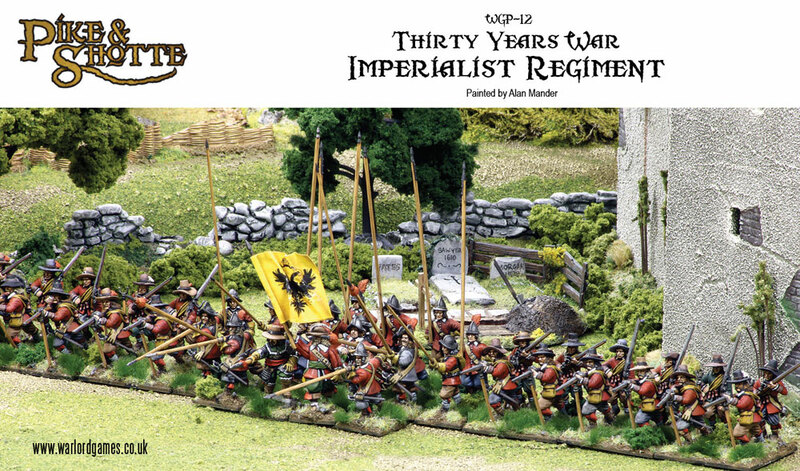 Those 28mm plastics Warlord sell of course look very pretty in the picture and are very good and affordable models but those shouldn’t be the only considerations. Pike&Shotte, like BP and HC, is a great set of rules. Some people don’t like the fact that pike blocks and units of shot are separate units. I’m still a little on the fence about this but feel free to use them as one formation. Things about the book I don’t like as much is the explanation of formations in the beginning. I can see why it’s there and it’s well meant but ultimately doesn’t add anything and leads to weird conclusions on the side of gamers. The extreme focus on the ECW is …well… I guess it’s hard to avoid. It’s a fascinating period with some revolutionary changes to warfare and well worth gaming due to the colour, the diversity of units (cavalry especially) and there was a LOT going on historically (even if we leave the ECW aside for once. 😉 ). I’ve recently been bitten by the ECW bug while going about my business, so it was really useful to easily find this great review of Pike & Shotte. Really enjoyed reading it and was very useful, as well as making clear to me how much hobby effort I’m getting myself into when I inevitably take the plunge.